I’m not a wedding photographer. I’ve only officially photographed three weddings in over 30 years as a photographer, one of which was a couple of years back when my own younger son got hitched, and I could hardly refuse his request. It was a long day, and the pictures cover well over 12 hours, and show a certain deterioration towards the end which could be slightly alcohol-related. There are just a few of them on My London Diary that give some of the flavour of the day, with some text that of course starts with me quoting Brodovitch’s “so you want to be a wedding photographer!”. The other two occasions each has a little story, but I’ll keep those for another time. Of course I’ve been to other weddings, but I make a point never to take a ‘real’ camera and to stay well out of the way of the professionals. So on Saturday, a guest, I turned up to the Gurdwara with just a little Fuji F31fd digital in my pocket, as despite having been told it would be fine to take plenty of photographs, I was really intending not to take much. 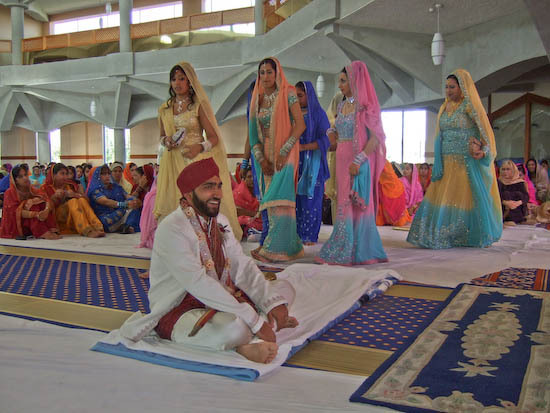 But it was my first experience of a Sikh wedding, and I soon found myself caught up in the colour and human interest of the event, and shooting at least as much as I would have done with my Nikon. Given the minute size of the sensor, the results are surprisingly good; perhaps the main failing isn’t noise or sharpness, but the colour quality. Hard to pin down, but it just somehow lacks the smoothness of colour and tone that the D200 provides, and at 6Mp the files are of course a little smaller. One of the reasons for choosing this model was its relatively good performance in lowish light, and a second its relatively short shutter lag, and both were useful. What I still hate about it is the lack of a viewfinder. Holding a camera out in front so you can see the viewing screen is just not a good way to work. It is much trickier to frame, and the camera is much harder to hold steady. So quite a few shots were not sharp, many more than I would expect with the Nikon under similar conditions. The vibration reduction (VR) in the Nikon 18-200 would also have come in useful. Push-button zooming is also a little of a disaster – very difficult to control the rocker switch accurately and much slower to be precise than the manual ring on an SLR lens. The 8-24mm zoom is roughly equivalent to a 24-72mm on the DX Nikons (35-105 on ‘FX’) and there were times when I would really have liked a wider view. All cameras are compromises, and given the size and low cost of the F31fd (mine as £133) it proved a remarkably effective tool. A final compromise for me is that the camera has no raw mode, and I was shooting using the highest quality jpeg it provides. The 2Gb XD Picture Card did add another £25 to the cost, but does hold around 680 images – enough to keep me happy most days – though of course I also needed to spend another £13 on a spare compatible battery. I don’t quite understand how, but this appeared to let me get something extra out of many of them, although not as much as with RAW files. I was also surprised to find that those files that I looked at later in Photoshop didn’t have any of the ‘comb’ effect – gaps in the histogram – which I would have expected from working on them. I also converted the files to Adobe RGB which I normally use with the Nikon. Looking at the files in detail it is clear that one of the main problems with my use of the camera is camera shake at speeds where I would normally have no problem with hand holding. Its a problem that I think would not be there if the camera had a viewfinder so it could be used held to the eye. I’ve not had the camera long, and I’m still struggling with the camera manual, which goes out of its way to be friendly while giving you as little actual information as possible. It has as what is called a ‘picture stabilisation’ mode, which appears to be is a simple auto program that selects higher ISO and shutter speeds than normal – but has been misleadingly named to suggest the camera incorporates image stabilisation – which it does not. What it does have is excellent performance at high ISO. Although the quality is best at the slowest ratings of ISO100 and 200, many of the images at ISO800 are perfectly usable. At ISO1600 it is still remarkably good. Without the use of specialised noise-reduction software the results are in the same region as those from the Nikon D200 at the same speed. Things do fall apart rather at ISO3200, but it looks as if we are going to have to save up for the Nikon D3 if we really want to work at that speed. You can see more of the pictures from Saturday’s wedding on My London Diary. I tried hard to capture all the key events in the ceremony without being in the way of those doing the job officially. I’m not sure if I can live with the Fuji. I’m thinking of trying to use it at the wide-angle setting either completely without a viewfinder, or possibly by adding a sports or accessory viewfinder on to the top of the camera. This entry was posted on Friday, September 28th, 2007 at 10:51 am and is filed under My Own Work, Reviews etc, Technical. You can follow any responses to this entry through the RSS 2.0 feed. You can leave a response, or trackback from your own site.